Egypt's Presidential Elections still somehow under way, despite all the controversies and roadblocks, now with 13 candidates going forward out of the original 23. For a break from more serious writing, here is a look at some of the most noteworthy candidate posters out there from the original 23. These are all the official posters, mainly being used on the streets, as well as some used predominantly online. 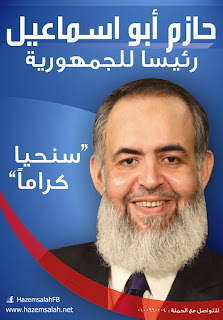 - Hazem Abu Ismail: independent Salafist candidate, and the most famous poster of all. 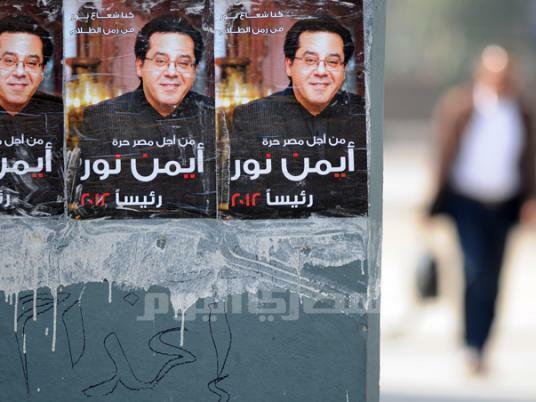 There have been so many of such posters printed and distributed all over Egypt in such a way that online satire was equally prolific. People made hundreds of jokes about it, as well as making photoshopped images of such posters finding themselves on the moon, all over the Great Wall of China, and on microscopically-imaged microorganisms. 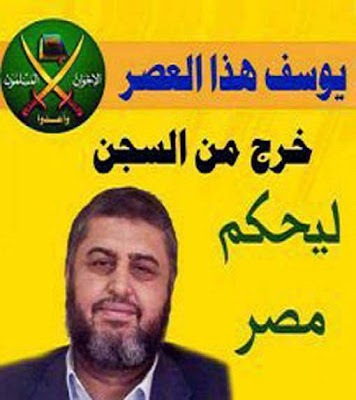 It is rumoured that Abu Ismail and supporters printed posters exceeding 40 million EGP in cost (hint: an activist associated with another campaig was raising 16,000 EGP so that he could print 100,000 posters.) 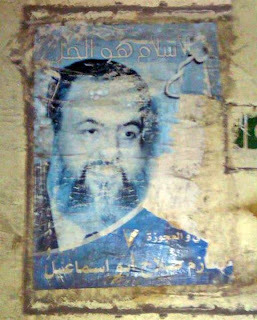 Next to it is Abu Ismail's old 2005 Parliamentary elections poster, using much of the same structure. Slogan: "We will live dignified." 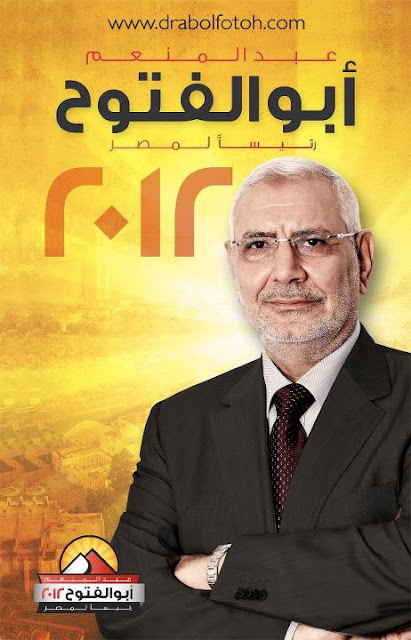 - Mohammed Morsy: described by some as the Muslim Brotherhood's "backup candidate" for having gone into the race in case Khairat El-Shater is not cleared for running for the Presidency due to his legal issues, Morsy still has no official posters. These are the official online posters used on MB websites, including the current welcome screen for Ikhwan Online. Some posters identify him with Al-Shater as basically two sides of the same coin: the MB's "Renaissance Project." That is basically done to increase the appeal of his sudden candidacy. Slogan: "The Renaissance... Will of the people." 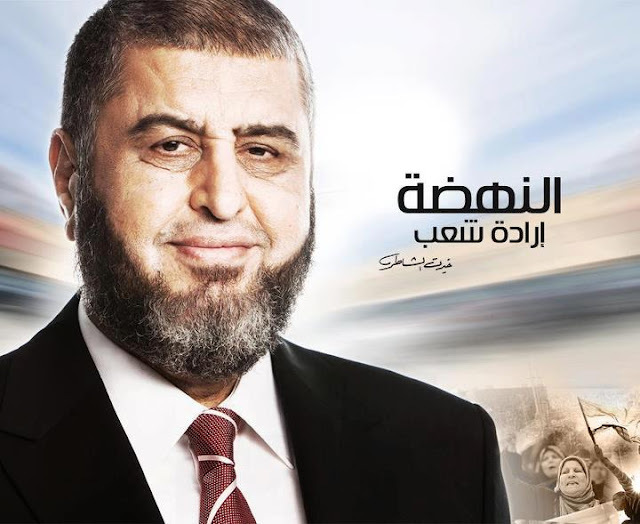 - Khairat Al-Shater: the MB's former deputy guide, said to be its main financier and strongest man, and also its original presidential candidate before disqualification. Posters tried to present a more vibrant image of the man who exhausted from previous imprisonment, health condition and asuperhuman workload. They also present him as the "architect of the renaissance project." 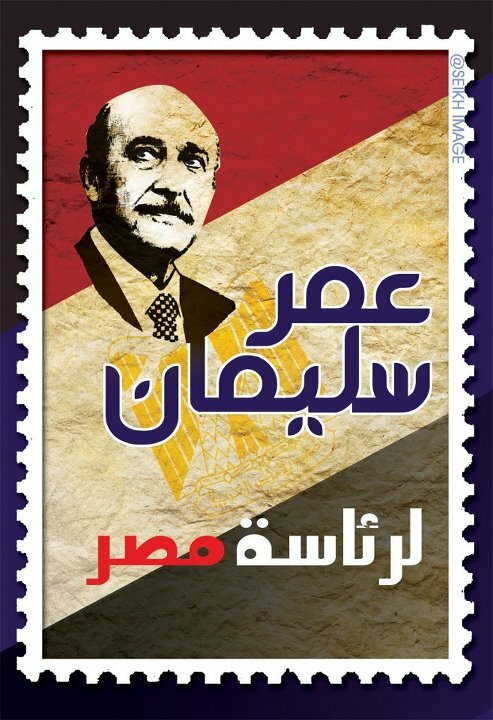 One poster that came out, most likely unofficial, was an online poster (yellow, below) claiming he was "The Joseph Of Our Times, "getting out of prison to rule Egypt." The slogan was also: "The Renaissance... Will of the people." 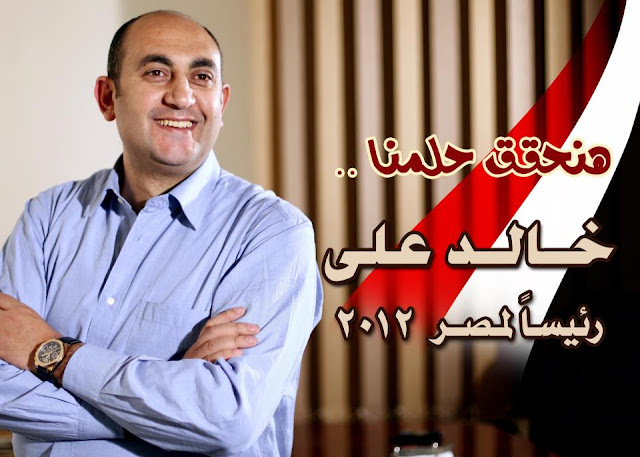 - Khaled Ali: often described as the "Revolution's candidate", this left-leaning human rights lawyer chose a simpler image, more youth-and-common-man-oriented, in his posters. He is the youngest candidate of all, and is said to be running officially to represent the purer and non-compromising goal of the revolution. Slogan: "We will fulfill our dream." 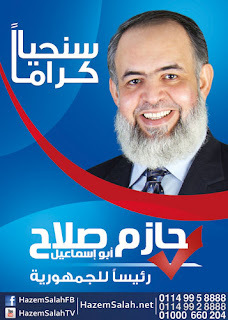 - Mohammed Selim El-Awwa: an independent candidate, a "moderate islamist and political thinker", his campaign is yet to take on full form. Posters are currently still quite varying, many unofficial. But his official online posters are the ones below. 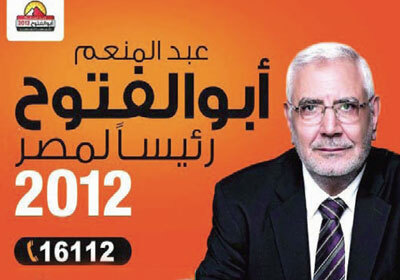 His message and slogan: "If I make mistake, then help me rectify. If I lost my path, then my removal from office is a duty." 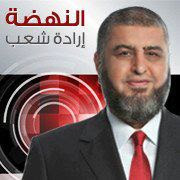 - Abul-Ezz El-Hariry: leftist candidate running on behalf of the Popular Socialist Alliance Party. His current Slogan: "The Revolution Continues." Slogan comes from one of the slogans and catch phrases used by revolutionaries after the January revolution, as well as the name of the electoral alliance that brought together younger candidates representing the revolution. 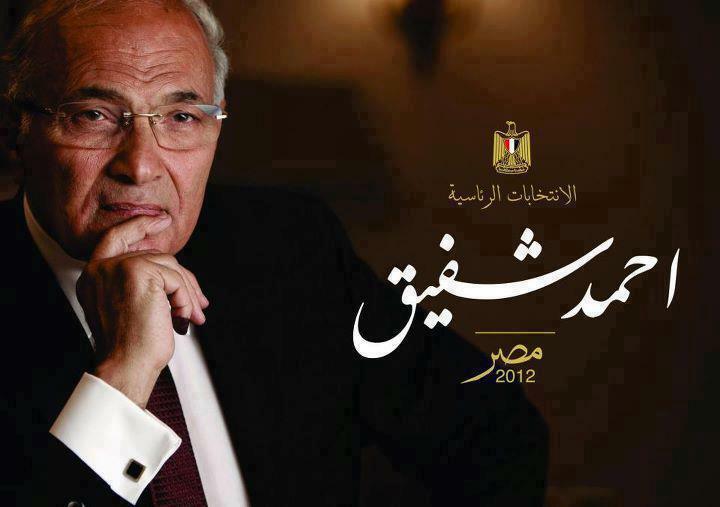 - Amr Moussa: former Foreign Minister and former Arab League Sec-Gen, he is the presumed front runner. Moussa is going for a look that would highlight that he is the "safe, respectable and strong" candidate. First up, you can find the main poster, focusing on his stature. Then, the campaign took another staple picture (found in the second poster) and put it on many posters with different backgrounds and different tag-lines. 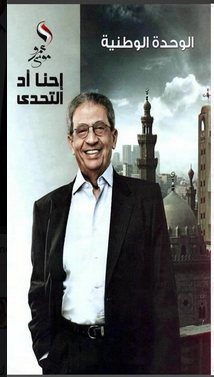 For example, the one below is him in front of a mosque and a church, with the tag line: "National Unity." The campaign slogan: "We rise up to the challenge." 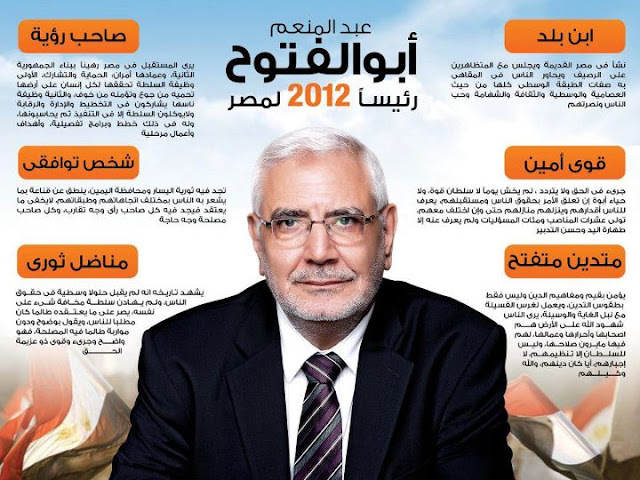 - Abdel-Moneim Abul-Fotouh: former leading MB figure, current independent presidential candidate. Abul-Fotouh is running on the idea of being the "Consensual Candidate," the one that all Egyptian can unite behind. He has a background in Islamism, yet is also considered progressive. For example, poster three presents him as the "Voice Of Moderation." Second poster describes his alleged characteristics, such as "strong and honest", "religious and open-minded", "a visionary." It is suggested that the choice of orange for his campaign colour is a reference to his relative youth and vitality compared to most candidates. 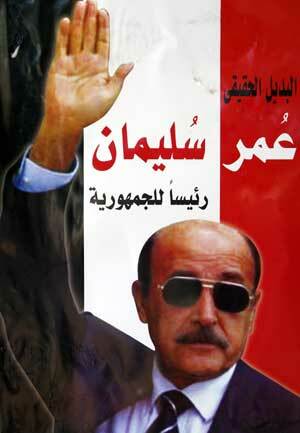 The Slogan: "President Of Egypt." I expected another additional slogan soon. 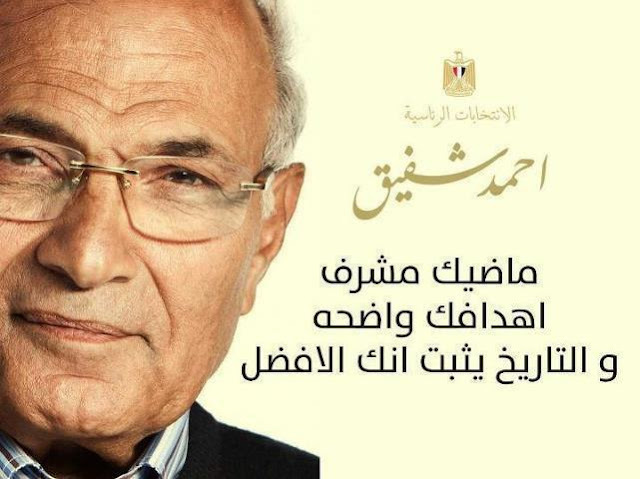 - Ahmed Shafiq: former close confidante of Mubarak, rumoured to be his preferred choice for successor, he was also the civil aviation minister and the last Prime Minister of the Mubarak regime. 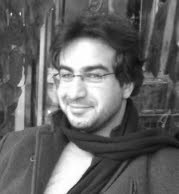 His candidacy remains a source of controversy given such close ties with the regime overthrown by the revolution. 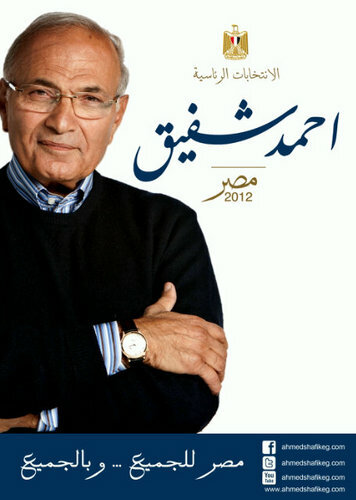 Shafiq is said to have "the most elegant" posters by a few commentators, yet still criticised for being a bit classist or alienating vis-a-vis less affluent and rural voter. First poster is official, the second two appear to be semi-official somehow. Slogan: Egypt for everyone, and by everyone. - Ayman Nour: liberal politician, was running (before disqualification) on behalf of the "Tomorrow Of The Revolution Party", and first candidate to oppose Mubarak significantly in a multi-candidate elections in 2005 (imprisoned shortly after), he was a late comer to these 2012 elections. I could not find a proper resolution image of his poster, but I found pictures of them on the streets, and the original picture without the text. He it noted for having said with genuine frustration: "I cannot find a place to put my posters!".. due to Abu Ismail's posters being everywhere. Slogan: "We were a ray a of light... in a time of darkness" (a reference to light since "Nour" means "light") - and "For a free Egypt"
- Hamdeen Sabbahy: independent candidate, Nasserist, Sabbahy has a long history of political activism. He is running on a populist platform, attempting to appeal mainly to less affluent and middle-class voters. Some detractors of the poster have claimed it lacked a more "presidential" look to it, especially for such a respectable candidate. 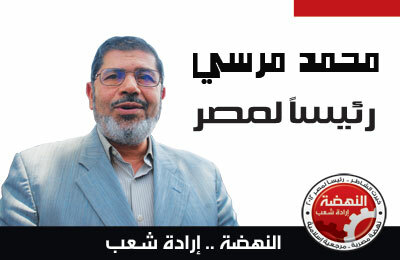 Slogan: "One of us, president of Egypt." 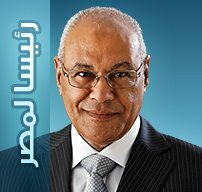 - Omar Soleiman: this former VP and Intelligence chief made a very late entry into the race, only to be disqualified as fast as he had entered. I have searched for an official poster, but couldn't find any. 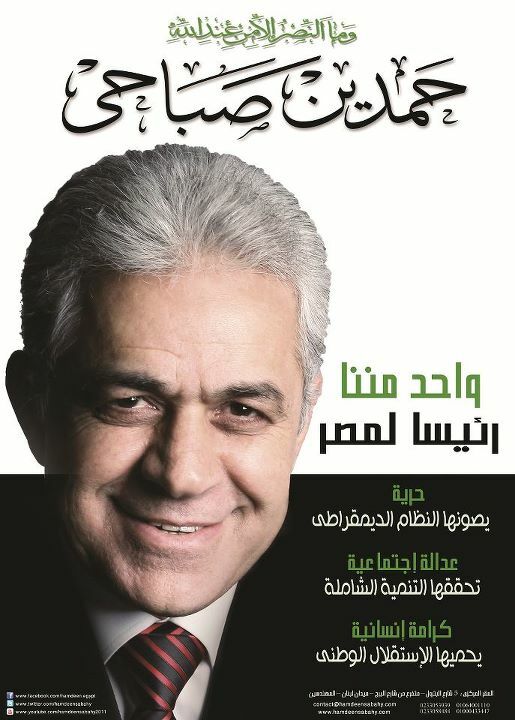 This, however, was the most common poster used and posted by supporters, online and offline. Below it was a better effort by his supporter's Facebook page. Slogan: "The true alternative. 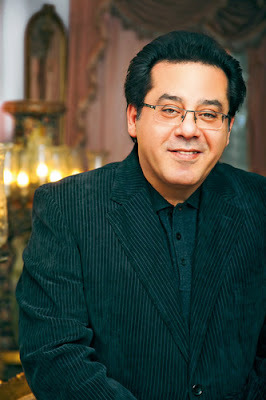 Omar Soleiman, President of the Republic." 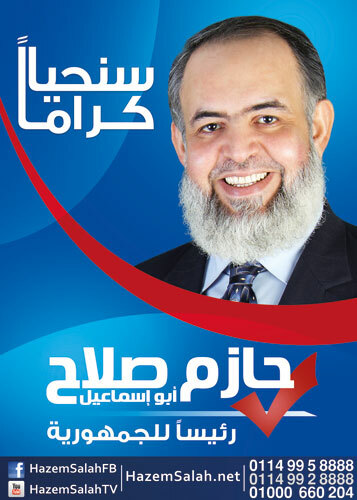 - Ashraf Barouma: candidate for the Masr Al-Kinana Party, posters show different sides of the versatile candidate. 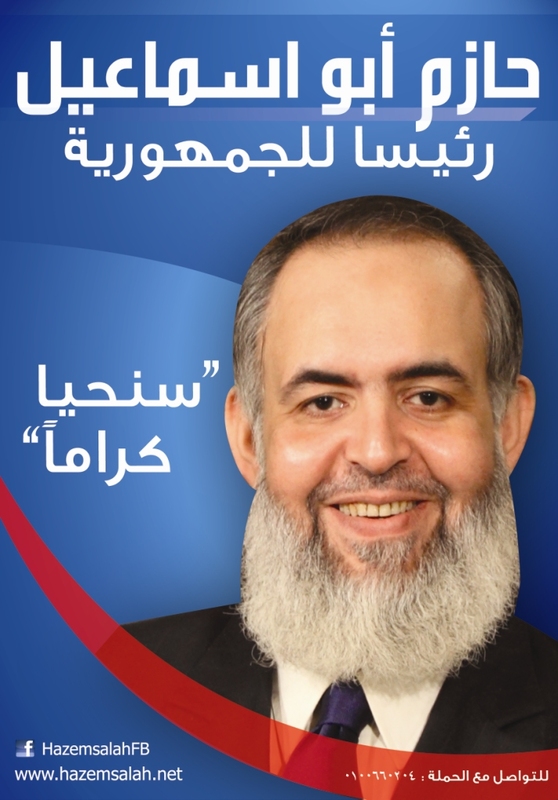 Now, Barouma was not really a serious contender (he was disqualified as well), but he was talked about much due to a surname that had some comedic undertones in Arabic as well as (says the poster in casual attire) the fact that he had a mysterious plan to "end poverty in Egypt in...228 days." I don't think Hernando De Soto himself had such a day-by-day plan for poverty eradication. 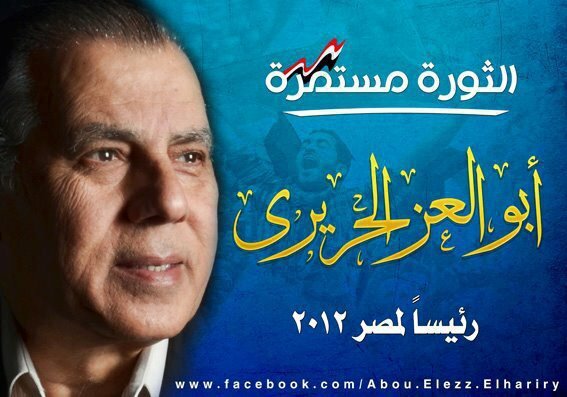 Slogan: "Ashraf Barouma, for leader of Egypt." and "Leadership has many meanings and principles... We have lived them." 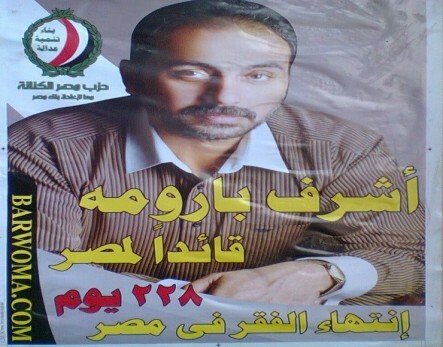 - Mohammed Hosny Mubarak: his 2005 campaign posters, for ol' times' sake. Yes I know that, well, technically he's not running...yet.